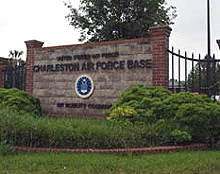 The Air Force officially named its facility as Charleston Air Force Base in June 1953. On 1 October 2010 the Naval Weapons Station combined with Charleston AFB to become Joint Base Charleston. JB Charleston (AB) is located about 10 miles from downtown Charleston, South Carolina, on approximately 3,400 acres of land. With a rich military history and a moderate cost of living, the area has attracted many military retirees that now call the Lowcountry home.